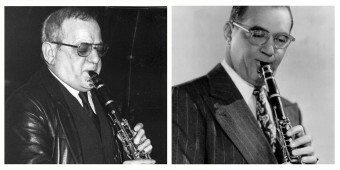 Diminutive, dapper and bespectacled, Steve Morris was a Benny Goodman look-alike who, like Goodman, played jazz clarinet. But, unlike the famous and reputedly arrogant Goodman, Steve was a modest and mild-mannered man, though he shared Goodman’s love of music and his desire for a world without prejudice, whether of race, religion or class. More than a glimpse, a little capsule, of that ideal world was created by Steve when, like his old musician friend Ronnie Scott, he fulfilled his dream of running a jazz club, one that would become internationally renowned. When Steve, with business partner Frank Cusick, took over Band on the Wall in 1975, the big old pub was closed and shuttered, almost derelict. The early 70s had seen the venue’s decline. Whether cause or consequence of that decline, there had been no fewer than six different landlords in the first three years of the decade (1): never a good sign. The venue’s reputation as a place for classy live music had already diminished when the almost-final tacit occurred following the closure of the nearby, vast Smithfield Market that for over 150 years had sustained the vitality and economy of the locality. Throughout all of those years, Band on the Wall, formerly the George & Dragon, had been a market pub. With the move of the Market out of the city centre in 1972 (2) the pub lost a substantial customer base – thirsty market traders, their suppliers and customers. Band on the Wall was now on the fringe of a fringe of the city: in ‘an overlooked district, languishing in a state of economic inertia.’ (3). By the early 70s, live music at the pub had become irregular and rarely notable and, in 1974, the music ceased, the venue was closed, perhaps for the first time in its 170-year history. (4) The troubled owners of the pub, Wilsons Brewery, offered the lease on the open market. But, given the loss of custom from the Market and the poor condition of the building, there was no bidding battle for the lease; not for the last time, the demise of the venue looked imminent. On most weekend evenings for the next four years Allan would have a special place on the stage that he built — as drummer and leader of the resident band. There was also occasional lunchtime theatre and comedy, including by future stars Rik Mayall and Ade Edmondson. These programme strands are explored in more detail in the subsequent sections of this chapter. The programme occupied different music territory from the pop hits of the day, late 70s songs such as David Bowie’s ‘Fame,’ Queen’s ‘Bohemian Rhapsody,’ ABBA’s ‘Dancing Queen’ or ‘YMCA’ by the Village People. The venue was immune even to disco hits such as ‘Stayin’ Alive’ by local boys The Bee Gees. Only with occasional punk rock and soul/funk bands on the New Manchester Review nights and those by Manchester Musicians Collective did the Band on the Wall programme in the 1970s encroach on the margins of the pop music of the day. ‘The Band’ was not about fashion.